U.S. President Donald Trump settled into a White House meeting on Monday by looking across a large mahogany table to Justin Trudeau to say nice things about the prime minister’s father. The remarks were prompted by a gift Trudeau gave the president that morning: a black and white photo of Trump delivering a speech in honour of former prime minister Pierre Elliott Trudeau in 1981. It was presented in a silver frame adorned with maple leaves. The president was touched by the gift. Trump opened a roundtable meeting on women in the workforce by saying how honoured he was to be with Trudeau, "whose father I knew and respected greatly." 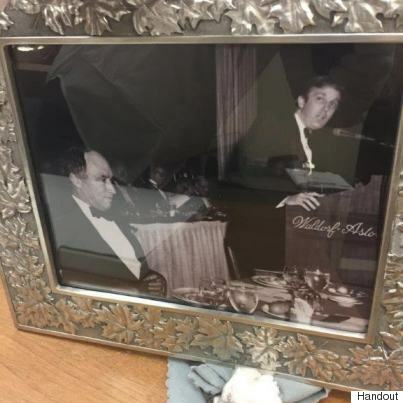 The photo, taken at the Waldorf Astoria hotel in New York City, shows Trump speaking at podium during a dinner honouring Trudeau Sr. with the Family of Man Gold Medallion award. At the time, Trump served as chairman of the awards dinner hosted by the international interfaith organization. The gift signals a sentimental strategy by the prime minister’s office in forging a relationship with the new Trump administration. Trudeau was guest of honour at a White House state dinner last year hosted by Barack Obama last year. He sealed his “bromance” with the former president when he gave Obama a signed copy of the “Star Wars: The Force Awakens” script. The prime minister has been facing increasing pressure at home to stand up to Trump in light of the U.S. leader’s previous comments about women and recent backlash over his controversial travel ban targeting those from seven Muslim-majority countries. Last week, in lead-up to his Washington trip, Trudeau stressed the commonalities the two leaders share with regards to job creation and security for the middle class. In areas of policy where they disagree, the prime minister said he would be respectful of Trump by treading those areas carefully.